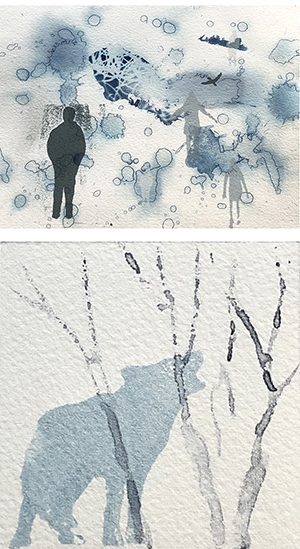 Using the theme of ‘Water’ the Dundarave Print Workshop artists explore their personal relationship with this ubiquitous substance, viewed as landscape, environment, sport, the thing of dreams and memory, and as a life sustaining necessity. In this exhibition, visual artists Alexa Thornton and Maria Tratt explore elements that, combined, inform ideas of self and other. textures. The course will cover drypoint, collagraph and basic monoprint techniques, as well as guide you through how to prepare your paper and pull a print using an etching press. The course is led by Maya U Schueller-Elmes, a printmaker from London, UK with over 10 years printmaking and teaching experience in community arts and adult education in both the UK and Canada. curious about use of plastic plates as a safer alternative to intaglio techniques. Learn the basics of this simple but versatile technique, including using positive and negative space in compositions and mark-making options to carve and print a plate made of thin linoleum. The tools for this method are inexpensive and will be available for purchase from the instructor. Suitable for beginners and intermediates alike. This two day workshop will explore a unique and spontaneous approach to printmaking. A collagraph print is made from a collage of a variety of materials glued together onto a plate. The collaged plate is then inked and printed to produce a richly textured and embossed image. Students will prepare, create and print their own plates in consultation with the instructor. The workshop is suitable as an introduction to printmaking or for artists who want to learn a new process. Students familiar with collagraph printing will be able to expand their knowledge and develop their imagery. Betty Jean Drummond and Marijke Nap were members of Dundarave Print Workshop for many years. Their enthusiasm for printmaking was infectious. Both experimented with their craft in response to the world around them. Betty Jean found joy in nature and the environment creating colourful, richly textured works in collagraphs and etchings. Marijke’s work speaks to social inequalities by exploration through digital and etched collages. Please join us in honouring the memory and the work of these two influential and important print artists. An exhibition encompassing whimsical narrative, story telling, and illustrative imagery. Dundarave is excited to be hosting BIMPE X this year. BIMPE is a showcase for small scale works measuring no more than 15cm × 10cm (4 x 6 inches). All printmaking techniques from traditional line etching to contemporary digital processes are represented. A catalogue will be available for sale. For more information visit New Leaf Editions.